Since its inception in 1987, the Metal Gear franchise has had one central theme: tactical espionage action. Its studly and stubbly hero, Solid Snake, is a masterful saboteur, able to complete missions undetected while grossly outnumbered and outgunned. In short, stealthy shenanigans are key. So imagine our surprise when Metal Gear Rising: Revengeance was revealed as a ball-busting actiontacular hack and slash romp, with all the drama and set pieces of Arnold Schwarzenegger’s entire filmography. Revengeance was unleashed in a blood-leaking series of explosions early this year, by the always-demented Platinum Games. These are the guys who previously brought us Bayonetta and Vanquish, so there was no doubt that another lunatic and over the top action game was on the cards. 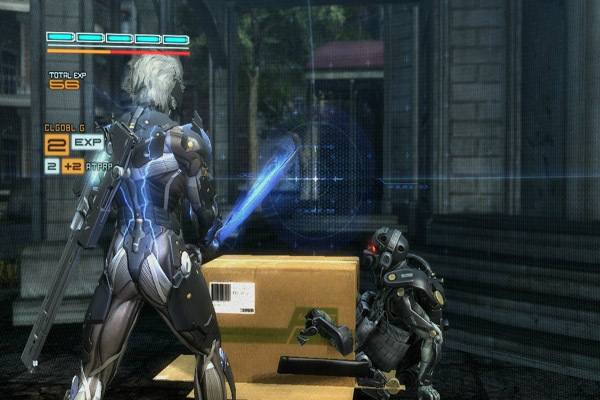 This one marks the return of Raiden, the sadly-not-Snake protagonist of Metal Gear Solid 2: Sons of Liberty. Set four years after the events of the fourth installment, Guns of the Patriots, this spin-off sees Raiden fighting against the military might of Desperado Enforcement. The plot is the brilliantly convoluted nonsense we expect of the series, involving children’s brains being surgically removed, military coups and an army of VR soldiers. 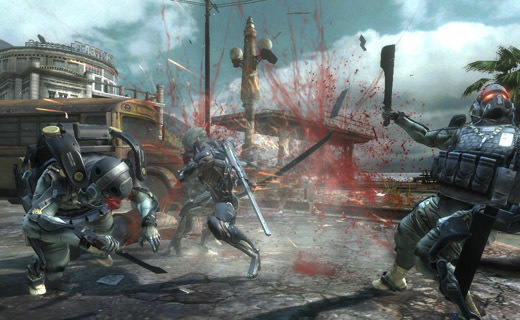 Revengeance is noted for its completely frenetic arcade action, involving muchos katana combat. The opposing horde of mecha-soldiers can be dismembered with your weapon, in a slightly disturbing and impressive Matrix-esque ‘blade mode.’ This allows for precision attacks to an absurd degree; even inanimate objects in the environment can be finely sliced apart. The game does share some elements of Metal Gear Solid. It’s a cinematic experience in every sense of the word: the rock-tacular soundtrack, the melodramatic cutscenes, the… girly-haired cyborg man and assorted Metal Gears trying to mangle him. It’s still quite the stylistic departure, but it’s one that’s worth experiencing. Style over substance, perhaps, but there’s certainly a heaping helping of style to be had here.